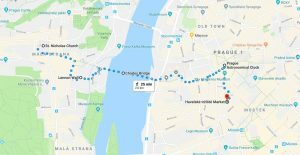 Presence 2018 conference plans include an optional group sightseeing trip around Prague on May 20th. The schedule will start at 10:30 am at St. Nicholas Church near Prague Castle. 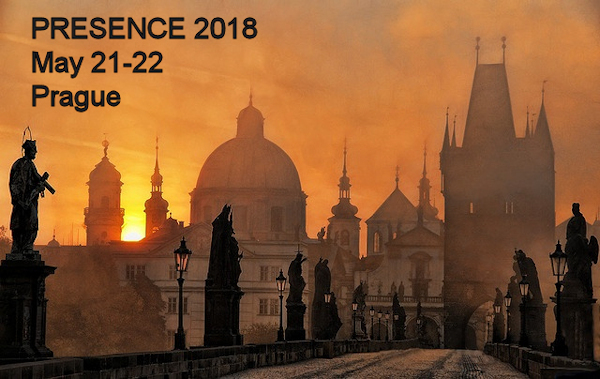 Presence 2018 conference plans include an optional group sightseeing trip around Prague on May 20th. The schedule will start at 10:30 am at St. Nicholas Church near Prague Castle. We are going to visit St. Nicholas Church, Charles bridge, Clementinum, Astronomical clock tower, and Havel market. Clementinum: The extensive grounds of the Clementinum, one of the largest building complexes in Europe, were built from the mid-16th century to the mid-18th century, originally as a Jesuit dormitory. In its Astronomical Tower, meteorological measurements have been collected since 1775. The most beautiful hall of the complex is the Baroque Library with beautiful frescoes and historically valuable globes. The Mirror Chapel with its richly designed interior and unique installation of mirrors is a place where classical music concerts take place regularly. (Source: www.prague.eu). NOTE: There is an additional fee for guided tour. 300 czk for basic, 200 czk for students and seniors, and 900 czk for a family. They also take reservation for group tour. Astronomical Clock Tower/ Old Town Square: The Old Town Hall is one of the most significant monuments in the Czech Republic. It was established in 1338 as the administrative seat for Prague’s Old Town. Now, it is mainly used for the ceremonial purposes of the capital city, Prague. The historical town hall consists of a set of five medieval houses, the corner of which is adorned with a historical astronomical clock, a gothic oriel window and a massive rectangular tower. The lookout gallery on the town hall tower offers the most beautiful view of Prague. A tour of the historical halls in the Old Town Hall is a unique experience. The expensively decorated rooms date from various periods and are examples of the remarkable development of the town hall complex. The guided tours in various languages are organized in hourly intervals. (Source: Tripadvisor.com). Where to visit in the Old Town Square: The powder tower, Kafka House, The Church of Our Lady before Tyn, Municipal House, & Jewish Quarter. Immersive multimodal media increasingly offer virtually realistic experiences, which can be harnessed for a wide variety of industrial, medical/psychological and recreational purposes. With special attention to notions of “reality” being a perceived and experienced world informed by our senses and actions across the lifespan, we review the fundamental scientific evolution of this multidisciplinary field. Using neuroscientific principles, we debate inherent value added and challenges of differing paradigms to consider in future health-care and educational endeavours. We often joke about how as telepresence scholars we have to travel around the world – with great financial cost, physical and emotional strain, lost time, and damage to the environment – to discuss technologies designed to allow people to avoid having to travel to meet face-to-face. We also take for granted that meeting in person precludes the participation of those who aren’t able to join us in person. This unique panel discussion is designed to consider the current status and future potential of visual collaboration technologies while actually using telepresence technology to include some of our colleagues who can’t be in Prague with us. An invitation to participate in the discussion via WebEx (https://www.webex.com/) will be distributed to presence scholars across the globe and at the appointed time the assembled and remotely present participants will informally discuss a series of questions including: To what degree are we able to experience social and spatial presence? What are the primary obstacles – in technology, psychology and context – to experiencing sustained presence? Which obstacles are most significant and when if ever can we expect to overcome them? Is a fully “virtual” academic conference possible? If so, when can we reasonably expect this to happen? And if so, would the benefits necessarily outweigh the drawbacks? This is your brain on VR: Designing a VR/fNIRS device. Many media technologies are designed to reflect human characteristics. For example, some robots are designed to have a human shape and humanlike movements. To evoke users’ medium-as-social-actor presence (i.e., perceiving a medium itself as a social entity) and corresponding social responses to these media technologies, innovators design social cues into the technologies, including facial expressions, eye gaze, handshakes, and abstract human characteristics such as reliability, lifespan, and identity. At the same time cues are critical to social presence with remotely located humans, avatars, game-generated characters and parasocial interaction, as well as spatial presence. This panel considers the role that these cues play in evoking presence. First Professor Lombard will introduce some vivid examples of medium-as-social-actor presence, beginning with clocks. Then Kun Xu will join in conversation with Professor Lombard on how the social cues of these examples trigger ideas about expanding the Computers are Social Actors (CASA) paradigm to the Media are Social Actors (MASA) paradigm. Hocheol Yang will discuss the case of a hitchhiking robot that was destroyed in Philadelphia during its global journey and how the case reflects people’s attitudes toward robots and the cues they present to those who encounter them. Professor Cummings will expand the discussion to include his insights regarding the importance and roles of cues in the spatial and social dimensions of presence experiences. Finally, all of the attendees will be invited to join in the conversation. This final panel is a summing up of the conference and a look ahead to the future of presence. The attendees will work together to formally identify, informally discuss, and prioritize some of the varied challenges that face those who theorize about, conduct research on, design, and participate in presence experiences. Questions to address in the process include: What do we most need to understand about how presence “works”? Is a “grand theory” of presence necessary and possible? Do we have adequate tools to measure presence experiences? Do we need more studies of presence “in the field” instead of the laboratory? How can scholars best develop practical advice for those who design (and market) presence-evoking technologies? What characteristics of presence-evoking technology need to be improved most? What new uses or applications of presence should we pursue? What can and should be done to ensure that presence is used ethically? How should we use, and not use, presence in our daily lives?